Fueled by new technologies, global markets, urbanization and changing demographics, the ability to drive new innovation is becoming an essential requirement for organizations to stay competitive today. The subject of innovation has dominated publications like the Harvard Business Review over the past five years, producing a steady stream of articles on subjects like “how to achieve innovation,” “how to find radical innovation” or “how to use clever collaboration to achieve innovation” every issue. All the signs point to the same realization… disrupt or be disrupted is the ethos of our time. Over the past 100 years, how we work has changed dramatically, and these changes have impacted workplace design. The workplace in the early part of the 20th century was characterized by productivity, and workplace design focused on efficiency. By the 1980s, the personal computer revolutionized how we work and launched the knowledge economy. Workplace design captured the spirit of individualization with the adoption of office landscapes and cubicles of every shape and size. Today's workplace is characterized by the drive toward innovation. While productivity and leveraging knowledge are still critical, innovation is now a stated and unstated tenant of business strategy—and workplace design is changing to focus on achieving innovation and collaboration. Our research has revealed that to foster innovation, the workplace needs to provide new types of environments that enable people to engage the resources, technology and the critical human interactions that create the “connections, context and the content” necessary for innovation to occur. Trends like co-working, mobility, social media, the gig economy and the maker movement are examples of the dynamics surrounding the innovation workplace. This year’s survey builds upon more than 10 years of work going back to the launch of Gensler’s first Workplace Survey in 2005, with each new survey helping us to better understand changes in the workplace and to uncover how the workplace can enhance performance at work. This year we surveyed over 4,000 people across the U.S. representing 11 different industries that employ 77 million knowledge workers. The data was analyzed using our proprietary Workplace Performance Index, which looks at how work is done and the performance of the workplace as a whole. We compared this data with an innovation index that identifies important factors driving organizational innovation. We plotted the innovation index results with our workplace performance results and found a tremendous correlation between workplace performance and innovation. In other words, we were able to show a direct link between key aspects of workplace design and higher levels of creativity and innovation. Given what we know about the growing importance of innovation in today’s economy, this discovery has significant and profound implications for workplaces, communities, cities and countries. We’ve proven that design not only influences the innovative process, but also that, done correctly, design has the power to drive new innovation forward in a direct and measurable way. To dive deeper into this data and help us understand what is unique about innovative workplaces, we looked for differentiating factors that separated our top quartile of innovative survey respondents to our bottom quartile. Several observations immediately stand out about innovative workplaces. Higher performing, more innovative workplaces are 10 percent more collaborative than less innovative workplaces and there is twice the amount of learning going on in innovative workplaces. People socialize 13 percent more often in innovative workplaces. The actual time spent on focus work is 14 percent less in an innovative workplace than in a non-innovative workplace. People in innovative workplaces work from conference rooms more than they work from open areas, and more individuals rely on amenities near their office space more often. Interestingly, innovators also work away from the office 26 percent of the time. For comparison, we also looked at what is going on in non-innovative workspaces. Most strikingly, people in these places have two times less choice and empowerment to work away from their desk. In other words, these people are feeling “chained to their desk.” Innovators have twice the amount of access to amenities as their non-innovative peers, and respondents in the bottom quartile of our innovation index were two and one-half times more likely to use their individual space to socialize and collaborate than our most innovative respondents. Unfortunately, a full two thirds of U.S. workplaces have not kept pace with the needs of an innovative workforce. To address this gap in the modern workplace, it’s important to recognize and avoid the common misconceptions and myths surrounding how people work and what they need in today’s workplace. Myth #1. If given the choice everyone would work away from the office. In reality, people would rather spend 71 percent of their time in the office. In discussing some of the results of recent research from his organization, Corporate Executive Board CEO Tom Monahan was fascinated to find that over 60 percent of his colleagues interact with 10 or more people each day to do their jobs, and 50 percent of CEB employees reported working with more than 20 people each day to complete their jobs. Further proof that people actually want to come to work is the growth of co-working. The co-working trend is remarkable because people are actually paying to go to work. Today there are over 8,000 co-working centers and facilities worldwide, with a large percentage of these places having opened in the last three years. There are another 10,000 co-working spaces being planned over the next two years. WeWork, the world’s largest co-working provider, has more than 50,000 members spread across 90 locations in 30 cities and 13 countries. Myth #2. Office buildings are going away. The reality is that office buildings are changing dramatically but they're not going away. 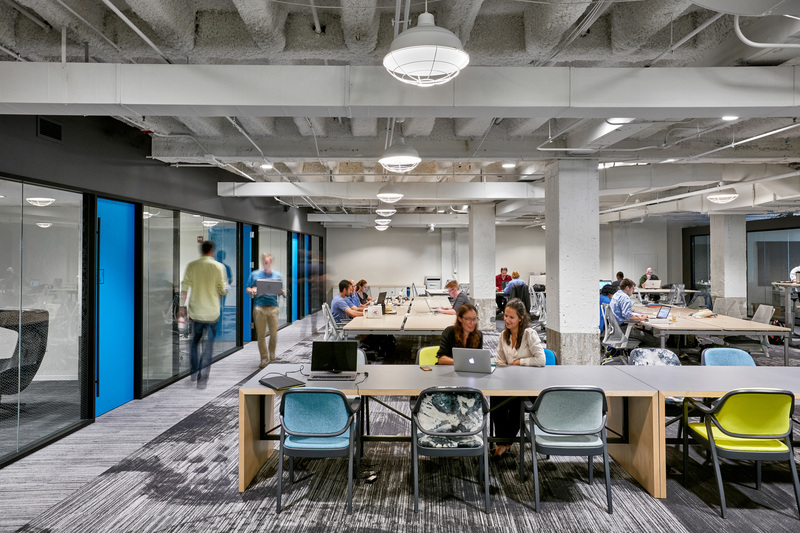 New buildings should consider floor plate sizes and configurations in new ways that better fit the needs of today’s knowledge workforce. Existing buildings need to seek out creative design solutions to support the kind of workspaces that drive innovation. Myth #3. Innovation is only about technology and Millennials. The reality is that innovators are located in every industry and hail from every generation. We looked at a breakdown of innovative workplaces and every industry is represented. Similarly when we conducted a breakdown of innovators by age we found that every generation is currently represented, with an innovator age range that spanned workers from 18 to 77 years old across our sample population. Myth #4. Collaboration is the primary goal of the Innovation Workplace. The reality is that all four work modes are essential: focus, collaboration, learning and socializing. In fact, over the past 8 years, our research has shown that individual focus work has consistently remained around 45 percent of time spent in the office, and focus work continues to be the most critical of the four work modes. Bridging the Gap: Key Solutions for Unlocking an Innovation Ecosystem. The innovation workplace isn't just about mobility, office buildings, tech and Millennials. Our research points to the critical factors that create an innovation ecosystem. We’ve found that it's about supporting the individual, supporting the team and supporting the community. Supporting the individual. You need to create a workspace that has a sufficient layout area for people to get their work done. This sounds simple, but it is often overlooked. We have found that attention has to be paid to noise management and limiting distractions, as well as easy access to other kinds of resources, people and amenities. Our research has found that if the focus work that an individual needs to do is not supported by the workplace, the entire workplace will not function. Supporting the team. Our research shows us that the workspace needs to include meeting spaces large and small enough to support all the different kinds of meetings and activities that go on within today’s work environment. Supporting the community. There are critical intangible design considerations that provide the secret sauce of innovation. First, giving people the choice to work in different locations throughout the day enables spontaneity and inspiration. Second, ensuring that the workspace reinforces the purpose and culture of the organization allows people to see, feel and experience why it is that they do what they do every day. Finally, allowing everyone to share in access to the different amenities, spaces, choice and sense of purpose introduces a degree of equity into the workplace that is essential for innovation. Our recent work for Matter, a non-profit for healthcare entrepreneurs based in Chicago, is a great example of this kind of high performance design in action. Matter’s workspace has important resources including event spaces, simulation labs and maker spaces for prototyping, in addition to high performing individual workspaces. 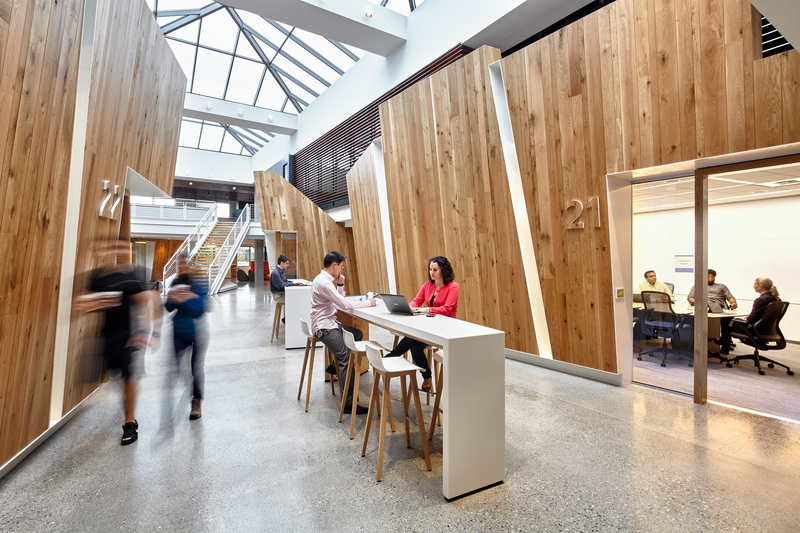 Another example of high performance workplace design can be seen in our work for McCann Erickson in San Francisco. 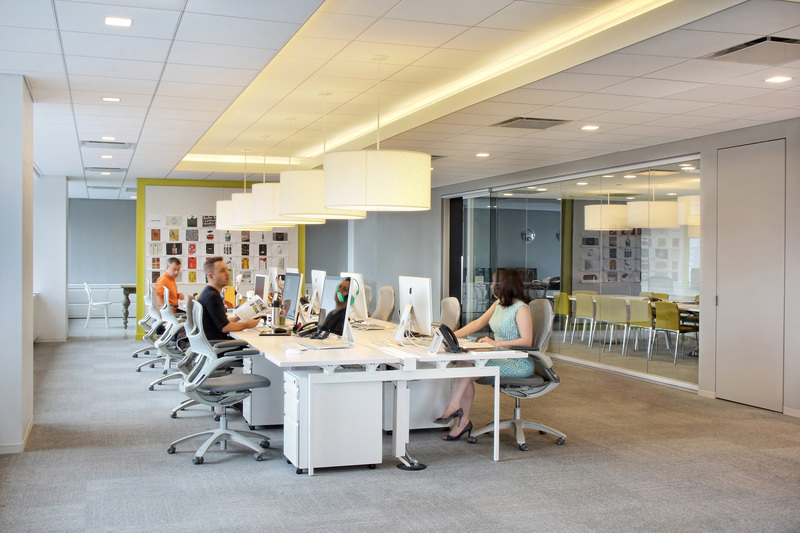 McCann’s workspace is characterized by its balance of ample individual space and team areas. The office encourages a high degree of collaboration, and individual workstations are laid out in clusters complete with see-through mesh partitions that provide a degree of privacy without unduly restricting communication. Small focus rooms, café breakout areas, game tables and a large layout surface are interspersed throughout the space to promote dynamic team interactions. 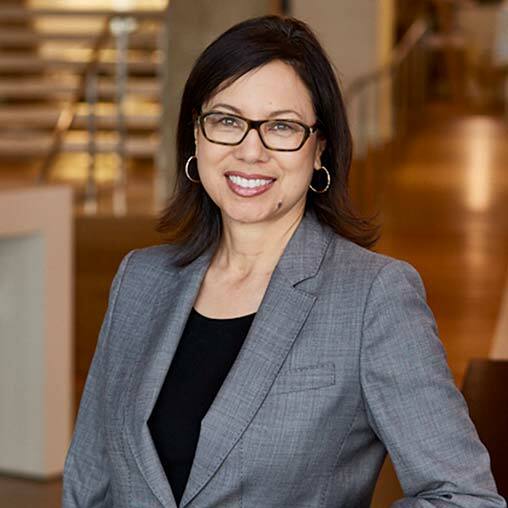 Marriott wanted something similar for its new corporate headquarters, which they viewed as an essential component of fostering a culture of innovation and greater collaboration. We designed a workplace offering more collaborative spaces and meeting spaces that included all of the technological resources needed to facilitate productive group work to help them reach this goal. 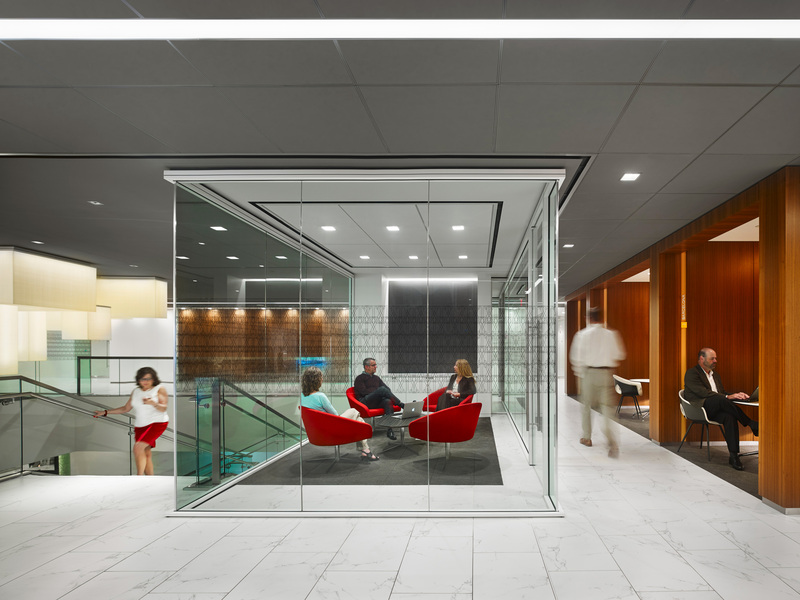 In our recent work on the Washington Post’s new headquarters, we focused on providing important technological support to help the Post reinvent itself in an open, energetic and wired space that is reflective of its new identity as a media and technology company. 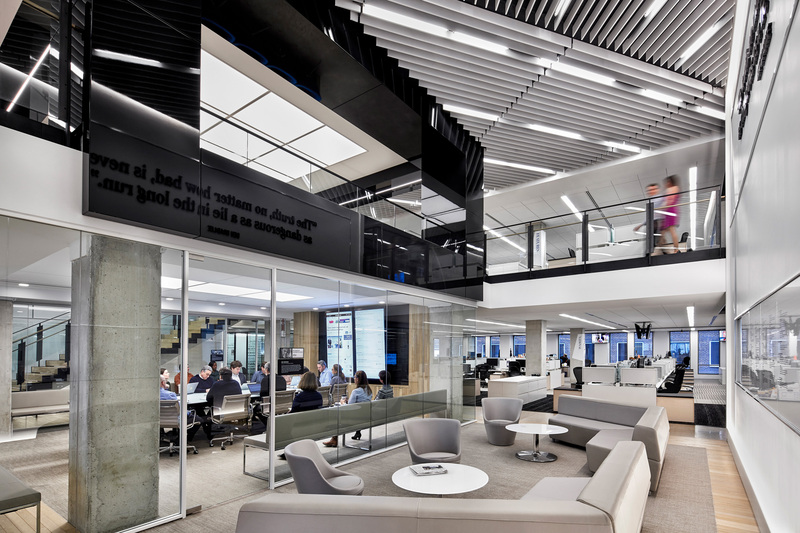 The new space has enabled the Post’s entire staff and news community to transition to a new, 21st century newsroom built to allow seamless, instantaneous communication between reporters, and allow for the dissemination of information across a growing number of media platforms. These examples demonstrate how supporting the individual, the team and the community create an innovation ecosystem in which organizations can excel. Our research indicates that there are 48 million U.S. workers that are working in a workplace that is not set up to help them innovate, representing billions of dollars in lost revenue and profit for countless organizations across the country. More importantly, it underscores the abundant untapped human potential in most organizations. Gensler’s 2016 Workplace Survey demonstrates how workplace strategies that drive innovation can unleash the creative potential of every individual through the power of design.